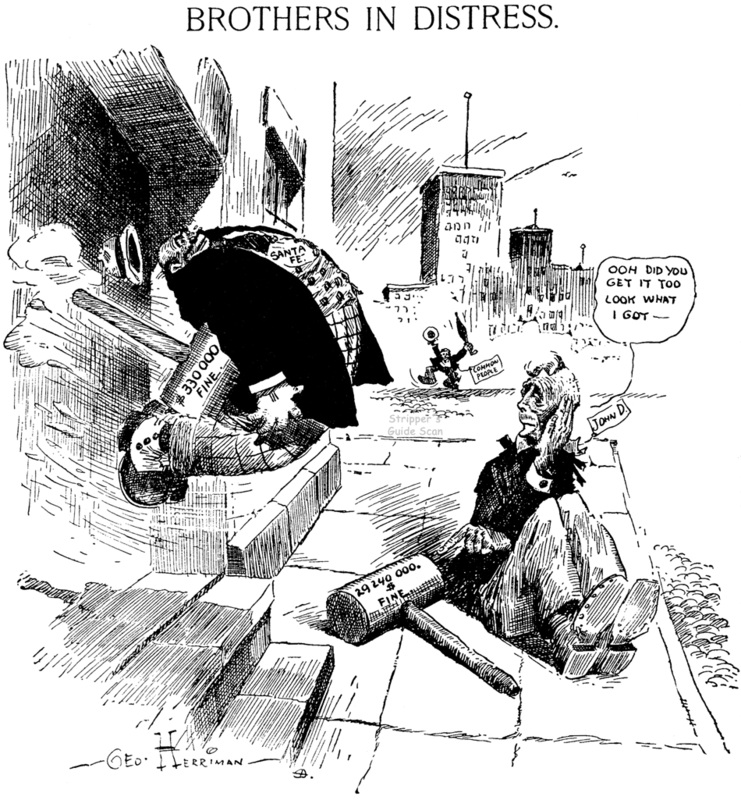 Monday, November 11 1907 -- The Santa Fe Railroad is fined $330,000 for giving "rebates" (aka kickbacks) to an Arizona cement company. This was a widespread monopolistic practice that also earned John D. Rockefeller's Standard Oil Company a $29 million fine, the largest by far ever levied up to that time. See the New York Times archive for a contemporary news account. Happy The Humbug was syndicated by the New York Post Syndicate from November 17 1946 to April 3 1949 as a Sunday-only strip (the strip was not around in 1940 as claimed on Wiki and other websites). 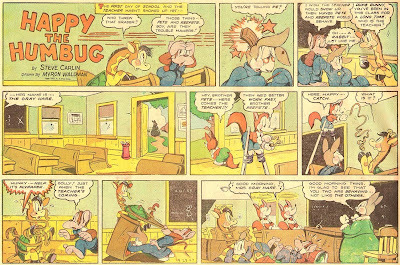 The animation-inspired funny animal feature got very little play in the nation's comic sections, a common problem for the features released through the auspices of the New York Post, at least until later on when Bob Hall whipped the syndicate into shape and made a success of it. When the strip was launched the syndicate claimed that a daily version of the feature was to follow, but apparently those plans never gave fruit. The concept that ended up as the comic strip actually began as a book written by Steve Carlin. Although the book was apparently never published, Carlin offered the idea to NBC Radio as the springboard for a series of Christmas-themed radio shows. According to the TVDays website the Christmas series was a minor hit and a total of 54 radio episodes of Happy the Humbug ended up being produced and syndicated. 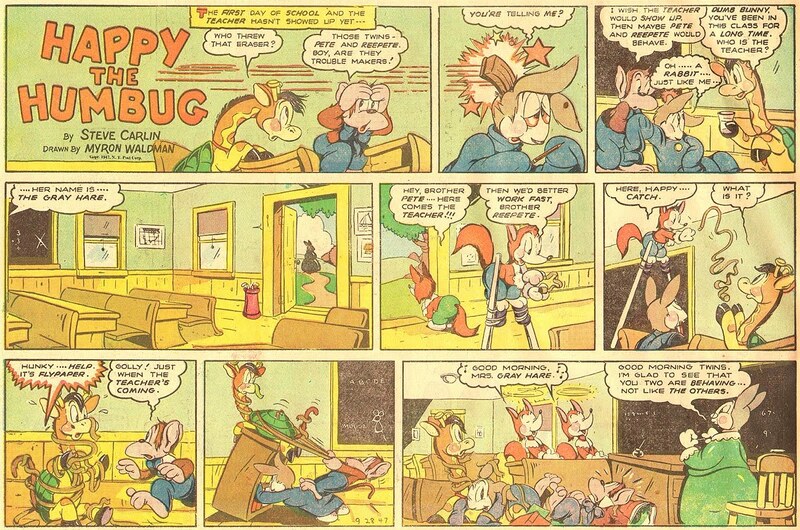 The same site claims that the comic strip version was already in syndication by 1945, citing an article in Newsweek. If that's the case then I can only guess about when and how it ran, because the New York Post dates came from Jeffrey Lindenblatt who indexed the paper, and I confirmed the start date based on an Editor & Publisher article. Writer Steve Carlin, who would later in his career create the TV phenom Rootie Kazootie, was fond of groan-worthy punny names (a few samples from Rootie Kazootie -- Polka Dottie and Poison Zoomack). But he really outdid himself on the comic strip Happy the Humbug. There was the Bum Steer, the Frightful Boar, the Monkey's Uncle, the Poor Fish, etc., etc. Carlin wrote the strip to appeal to much the same age group as his later TV show, but threw in a few nods and winks to the grown-ups. As far as I know this is the only syndicated feature with which Carlin was associated. 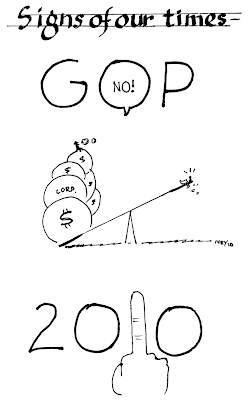 Cartoonist Myron Waldman, as you might guess from the art, came from the world of animation. His career began at Fleischer Studios where he worked on the Betty Boop and Superman shorts, among others. Later he moved to Paramount where he was head animator. He is best known for his work on the Casper the Friendly Ghost series, done in the same era when he was working on this strip. There was also a R C A children's record in 1948, Happy the Humbug has a birthday, by David Wayne. Hobo strips were quite popular back in the early days of newspaper comic strips. 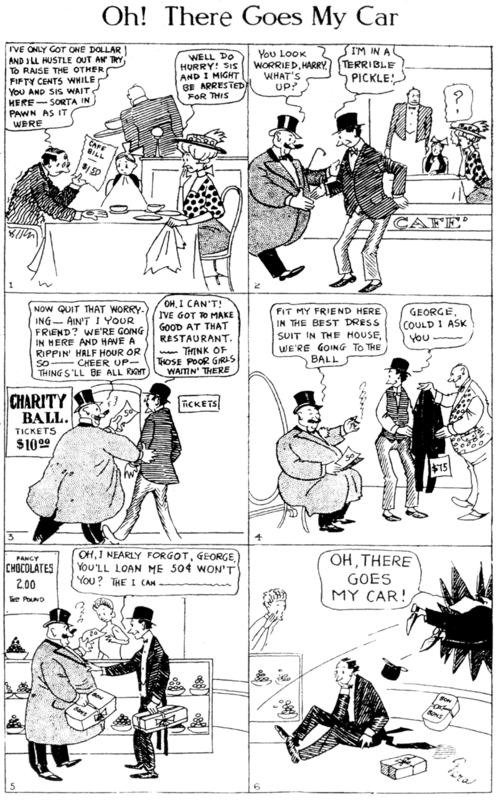 The versatile concept allowed cartoonists to change their venue for each strip, and the hobo's constant search for a handout and his escapades with the 'bulls' made for gags that practically wrote themselves. Later on the conception of the hobo was softened and we got weak sister versions like Pete the Tramp, Benny, and Frank and Ernest. These hobos were cast more in the light of knights of the open road, or even simply park bench philosophers. My guess is that the last true hobo strip might have been Slim Jim, who managed to hang on into the 1930s through the auspices of World Color Printing.Can anyone think of a later one? 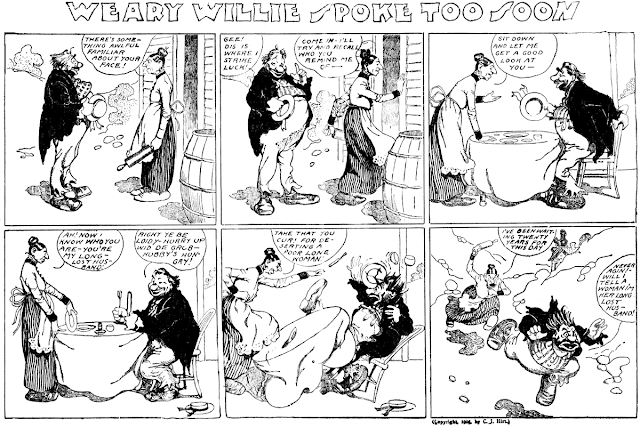 Weary Willie, by the wonderful Ed Carey, was a cookie-cutter hobo strip, and didn't last long in the C.J. 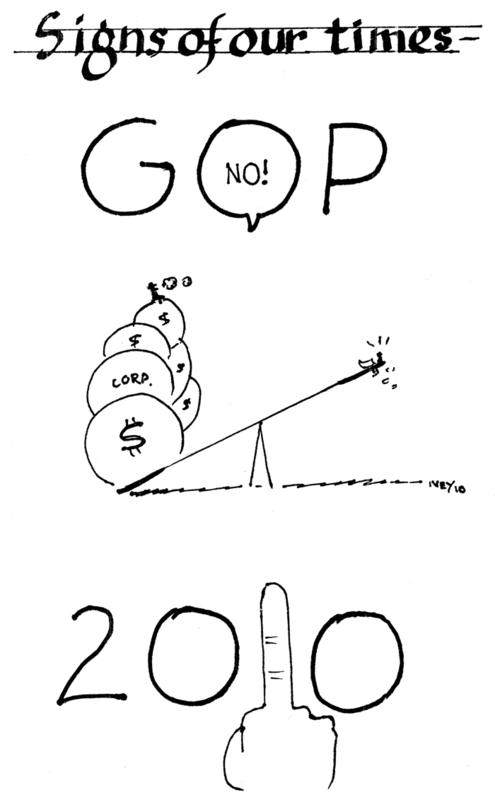 Hirt version of the McClure Syndicate Sunday funnies section. It ran from May 7 to November 26 1905. Tip of the tomato can to Cole Johnson for the sample! He looks alot like Carey's other hobo star Brainy Bowers, which was before and after this. Here's a rarity from the Los Angeles Examiner. A.C. Fera made a quick stop at that paper in 1909. I recall that he also worked for a much longer stint at another L.A. paper, but I can't seem to find that information at the moment. Looking through the standard references I find essentially no biographical information on Fera at all. Fera later had good success with his syndicated Sunday strip Just Boy, but back in the oughts he was just another local cartoonist in southern California. During his time at the Examiner he created two weekday strips; we've already discussed What You Lafin' At?, and here's the other, Oh, There Goes My Car. The title puts me in mind of a slapstick strip about runaway autos, but it turns out that the cars referred to are trolley cars. The gag is that some poor shlub in need finds a real 'hail fellow well met' buddy who is delighted to see him until comes the time for asking a favor. Then the jovial buddy takes it on the lam, yelling that he must catch a trolley. 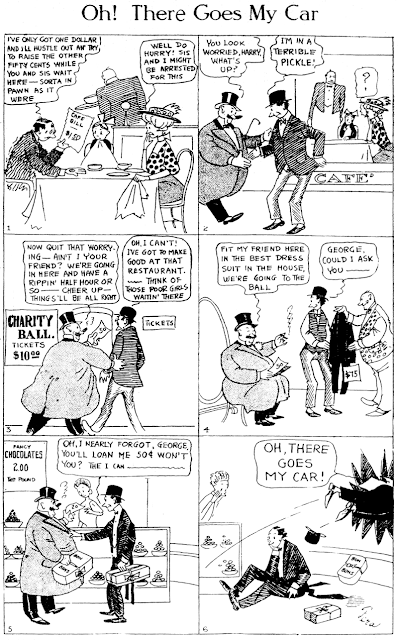 The strip ran on just a handful of occasions from October 30 to November 24 1909. Adolph Christian Fera was born on September 14, 1877 according to his World War I draft card. In the 1880 U.S. Federal Census, he was the oldest of two sons born, both in Illinois, to Charles and Mamie. The family lived in Danville, Illinois. there as a cartoonist for the Hearst papers. The 1910 census has Fera living in South Pasadena with his father and aunt. Fera's occupation was cartoonist at a newspaper. That same year a collection of his cartoons was published under the title, "Post Cards of a Tourist (Mr. 'Skinny' East): Cartoons of Southern California". Below is a description from "Art Books, 1876-1949." appeared in "The Los Angeles Herald." Fera married in the mid-teens and started a family. He registered for the draft on September 12, 1918. On the draft card it said he was living in Los Angeles as a cartoonist, working for the Newspaper Feature Service in New York. In the 1920 census, he was married to Mabel, had two sons, Gilman and Donald, and lived in Los Angeles on Western Avenue. In 1930 the Feras were still in Los Angeles, where they resided on South New Hampshire Avenue. He continued cartooning for a newspaper. Fera died on June 15, 1941 in Los Angeles, according to the California Death Index.